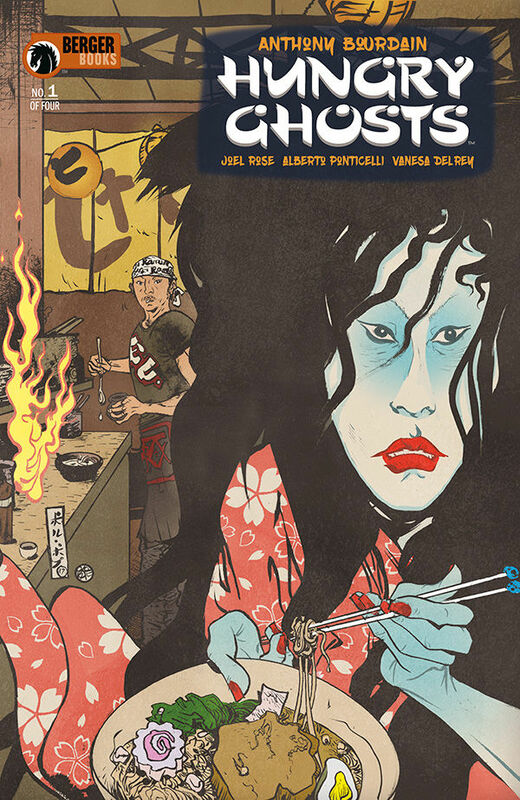 Dark Horse Comics has a collected compilation of Anthony Bourdain’s Hungry Ghosts ready to release October 2nd. I find myself in a conundrum, do I want to buy this work again? All I can hear from this great chef’s spirit, “You’ll want to go back for seconds, you will not be disappointed.” This release offers new material to sink my teeth into, and thankfully the preview I looked at affirmed the new content is indeed very delicious. The added content is perfect for those who do not know their Japanese folklore. Everything people wanted to know about these particular figures used in this work but were afraid to ask is summarized and given a lovely illustration like it was drawn from a Japanese artist. This also includes the game of Hyakumonagatari Kaidankai (100 Candles)! In brief, Samurai challenge one another to scaring one another with supernatural tales and at the end, one of the candles is blown out. In the end, a real terror is lurking in the darkness. Bourdain’s work gives the tales a culinary twist. My review of the first issue and subsequent issues can be found here. and by fllowing the trail of links after each article. Each story deals with a particular malignant spirit. To name a few, the Kappa, Tsukimono or Jikiniki are a sampling of encounters the protagonists must face. When I first learned Japanese, I thought bakemono was a generic term for ghosts. The explanation offered in this book explains that these creatures are specifically animal spirits and it is not a blanket term. The new section offers classical depictions of the Japanese spirit world. That is, they are drawn in a style expected to be found on a scroll. The illustrations by Leonardo Manco are beautifully detailed, drawn in charcoal and ink. His work makes owning this edition a must. There’s no need to seek the individual issues out, as they hold no collector’s value and those discovering this work late is not missing out on anything. As with most collections, the original covers are reprinted and I hope Dark Horse will offer high-quality poster-sized prints. They are worth putting up for the upcoming Halloween season. Plus, I can try my hand at the recipes offered in this edition. The Tokyo Ramen dish should be the easiest to prepare. The only long part is in preparing the broth. This chef’s variation by description alone sounds very mouthwatering, and I did have the real deal when I was in Japan years ago. To learn how to make my own will not be as expensive as traveling there. However, I think I need the spirit of Bourdain to guide me if I’m to attempt making Pan-Seared Duck Breast with Red Cabbage. I’m no master in the kitchen, but the thought of this delight is tickling my fancy, and I better not be feeling a finger on the side of my tummy. I’m squeamish there!